To get the very best out of your bike for the way you use it, a session on the GP Performance rolling road dyno can save a huge amount of time and heartache, not to mention money. By assessing your starting point, an accurate picture of the benefits of any tuning is there in plain view. Whether you want to make the absolute maximum for sport like drag racing, or get the best economy out of your tourer with smooth power delivery, the dyno chart tells all. Grant's expert eye can quickly detect areas for improvement and get you on the road to success pronto! To paraphrase the old song, it ain't what you've got, it's the way that you use it, setting up on our rolling road dyno will inform not only of maximum power. The spread of power, where it comes in, where it fades and any flat spots are just as important when it comes to the knowledge necessary to get the best from your bike. This information can then be applied to tuning methods or how you ride the bike when racing. Use our years of experience in tuning and measuring for optimum power to quickly get to the place you want your bike to be. Here are some examples. Motorcycle-dyno-charts page, GP Performance for prople living in BMW. 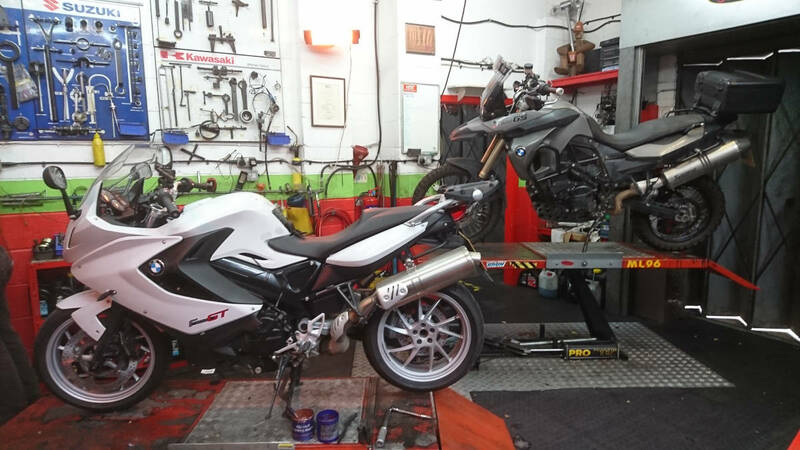 Whether you own a new BMW Tourer, Sports Bike or an adventure bike from their range, you can rely on GP Perfomance for reliable, efficient and top quality servicing and repairs carried out by factory trained technicians. You dont even have to lose a day off the road when you bring your bike to us. Give us a little bit of notice and you can book one of our courtesy bikes to keep you moving. For people interested in Motorcycle-dyno-charts in BMW.